Gunbot allows you to trade an enormous amount of crypto currency pairs, dependent on the exchange you choose to use it on. Trading pars consist on your primary coin, which is the currency you are purchasing with, such as Bitcoin, and your secondary coin will be the coin you chose to purchase, such as Binance coin. There are numerous indicators you can focus on in order to minimize your risk, which I will cover in this article. 1. Choosing an exchange to trade on. 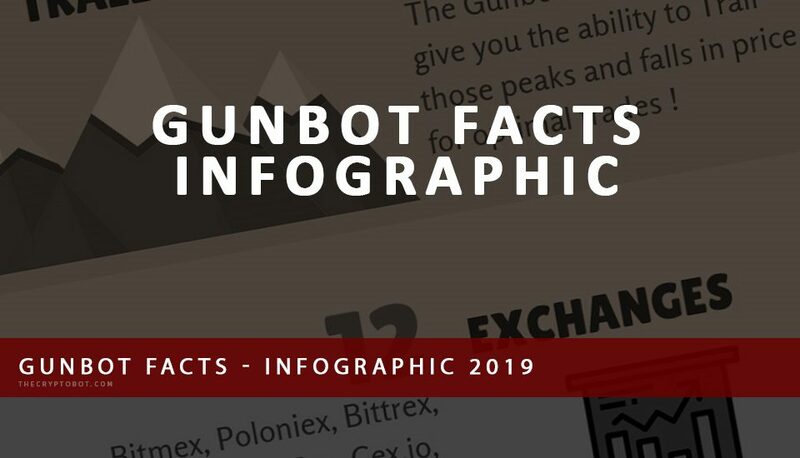 The Gunbot crypto trading bot is available for a wide variety of exchanges, and plan on expanding onto other exchanges as they prove their viability. Currently we are available for Binance, Bitfinex, Bitmex, Bittrex, Cex.io, Coinbase Pro, Cryptopia, Huobi, Kraken, Kucoin, and Poloneix. Choosing an exchange to trade on is a preference that is up to the user, but usually people are swayed by conditions such as the Alt-Coins available, the trading volume overall and on a specific coin, as well as regional availability. Certain exchanges will have available coins that are not on others, so if you are on the lookout for a specific coin, ensure that it is on the exchange that you are wanting to be active on. 2. Determining which primary currency you want to purchase Alts with. Although most people will want to trade with Bitcoin as their primary currency, certain exchanges offer other primary coins that you can use. For example, Binance offers BNB, which is the currencies own currency, as well as other stable coins, which are coins that are pegged to the U.S. dollar, such as TUSD, USDC, and USDT. Each primary currency has its own pros and cons, depending on how you feel about the stable coin and the companies that issue them. Some people prefer to sell their Bitcoin into a stable coin if they feel that the market is too volatile, but others will prefer to constantly accumulate their Bitcoin because of their positive outlook for the long-term valuation of BTC. 3. Determining which secondary currency you want to purchase. Selecting a coin to invest in for either long-term or short-term holding can be strenuous, as choosing a coin that can outpace a similar project can be the difference between having enough extra cash to buy a coffee, or buying a coffee shop. Checking the volume of the coin-pair you are interested in trading on is important, but also ensuring that the volume taking place is not an artificial pump that will soon lose an enormous amount of value. Also, checking the volume of the same coin and ensuring that it’s not in free-fall devaluation is just as important. Keeping those two subjects in mind is important, but also investing in something that you personally feel is a viable technology can help calm your nerves if it does happen to fluctuate at times. Keep in mind that numerous current billion-dollar companies sprung up from the ether, so if you have faith in a product, HODL, and trade to the point of making profit while also using the “Keep_Quote” option to consistently put aside tokens that you want to keep for the long haul. 4. Verifying that the trading pair is good for trading. First, make sure that you configure your Gunbot trading pairs correctly, such as “BASE – QUERY”, which equates to BTC – ALT. BASE is BTC and QUERY is the ALT. Tradingview shows it as QUERY-BASE, while most markets show the pair as QUERY-BASE, while Gunbot requires you to enter your trading pair(s) as BASE-QUERY, so please keep that in mind. Also, due to the infancy of cryptocurrency, even at this day and age, some coins have gone dark as far as progress. At times, coins can be delisted from an exchange and the only notice you will have is perhaps an email and a slight ticker somewhere on the website. If this happens to occur, and you forget to trade off those coins, you will be stuck with a cryptocurrency that you will no longer be able to trade. Spending a few minutes a day verifying that particular coin-pairs you are investing in are still viable options, will save you a lot of headaches in the future, so whenever possible, try to keep up with markets that you are involved in. Good pairs to trade will always have a decent amount of volume and value, compared to coin-pairs with no volume that are risky and trades may occur, albeit slowly. The overall volatility of Bitcoin will also affect the outcome of your trades so if you gain Santoshi’s, yet notice that your dollar or euro balance doesn’t chance, it will be a result of this fluctuation, so don’t worry about it. If you have plans to long term hold Bitcoin, accumulation should be your key goal, so if you can sustain your investment throughout the fluctuations, you should be happy with your overall results. 5. Setting a Stop-Loss … or not. Each and every investment has its associated risk, so knowing your limitations is key. Some people have overextended themselves in pursuit of their aspirations, but there is nothing better than stepping out right before a huge pitfall takes place. Knowing the reality of what recovery is necessary to break even when coin drops is paramount. For example, if a coin loses 10 percent, it will require a recoup of that initial ten percent loss, just to break even you’ll need a 11 percent upswing. If your Alt-coin loses 50 percent of its value, you will need a full 100 percent gain to break even. Keep in mind though, if you buy a cryptocurrency, and sell at a loss, trying to catch the moment it hits bottom in order to sell during a green market is really difficult. Even with the best charting and indicators, there is no sure way to know if a market will recover quickly, or if it will continue to plunge due to fear of missing out, or some recently announced bad news about the company behind the coin. Hopefully this article has helped you determine how to choose your trading pairs for configuring your Gunbot trading bot. Do you think the amount of exchanges will help you have better exposure to the overall cryptocurrency realm, or do you feel that saturation will simply dilute the overall market? Does the automation of Gunbot make you feel more secure in your trades, or are you the professional trader types that dial-in every single aspect of your trades within the configuration so you don’t have to worry?